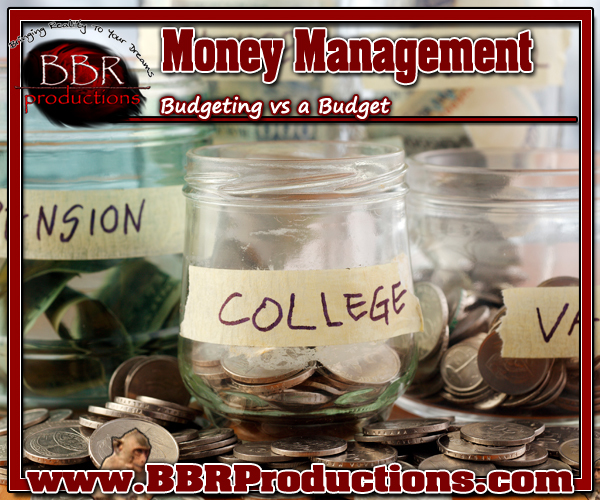 The difference between both Budgeting vs a Budget comes with process vs preparation. Budging is maintaining a cost effective spending cap. Spending less than is saved. Where as a Budget is the figuring of those caps. To budget is to set caps and restrictions. Figuring out each category of where and when to spend. Mastering how Budgeting works begins with understand a budget. Starting with an average month expense list. Take that list to organize categories and place caps on those expenses. Figure out which expense are Wants vs Needs, and cut accordingly. Eating out is usually a ‘Want’ which can be cut fairly easily. Leisure is also a ‘Want’. A ‘Need’ is rent, groceries, utility bills, hygiene, etc. 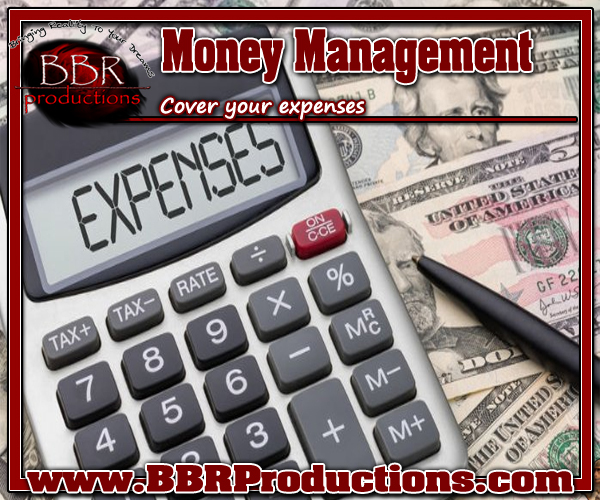 Take 3 to 6 months of past bank statements and add up each category expense. Once these Caps are figured into a person’s lifestyle it comes down to habit building. Keeping to strict restraints until money begins to overflow into a person’s ‘3 Needs of Purpose’. Learning to organize and prepping for future months helps take managing control back over a financial budget. A yearly expense should be saved a little each month. That’s a nice helpful truth! Figuring out a budget creates monthly caps which are based on a monthly average. Normally it is suggested to take 3 months and average them out. However, a full year gives a better overall example of an average monthly budget. By taking the Monthly Average and multiplying it by 3, it sets a cap total for covering expenses up to 3 months. This money saved is known as a ‘Safety Net’. Or total covered expenses. The best way to approach a Safety Net is by maintaining 3 months of capital into a designated account. Always maintain 3 months worth of capital within this account. While any money over expenses can now be placed in 3 other accounts known as the ‘3 Needs of Purpose’ : Security, Growth, and Dream. Continuing this process helps to grow strength in fueling a long lived company/life. Allow Security to protect calculated opportunities to risk chances. Growth is allocated moneys to place into investments. Stay aware of small investments; Stocks, Bonds, Mutual Funds, Intellectual Properties. Then move onto larger investments; Real estate, Businesses, I.O.U.’s, and Commodities. 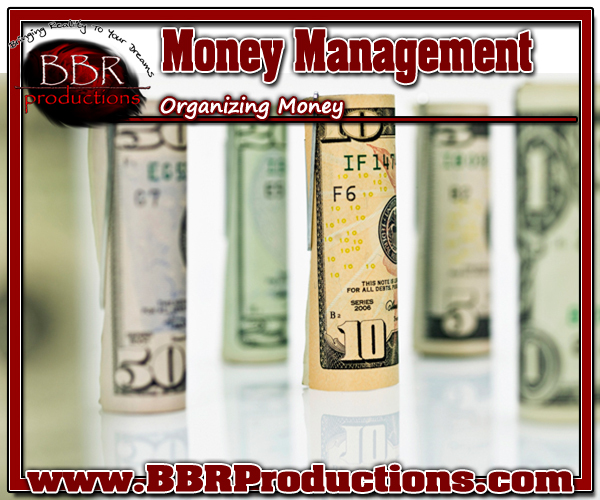 Organizing money is key when managing finances. Where to place the income to pay expenses, and to sort out moneys over expenses. There are four accounts every business should have: In/Out Flow (Safety Net), Security, Growth, and Dream. Each of these accounts have a specific function(s) to help better see any company prosper from utilizing money to mastering wealth. In/Out Flow: also known as a person’s Safety Net, is the main bank account. This is where all money earned and expenses go through. Any money over a Three (3) month Budget Safety Net (known as Money Over Expense or MOE) is then given the 60/40 ÷ by 3 action. That split is placed into the 3 Needs of Purpose; Security, Growth, and Dream. Security is to protect an individual/company when there is zero dollars left. It is the last resort ‘Need’. Growth is allocated toward investments. Placing any money in this ‘Need’ into smart Assets. While leaving a Dream ‘Need’ for the things an individual/company desires. A vacation, new house, a company celebration. Learning to organize money is the first step to mastering Money Management. Experience is giving people something they can relate to. “Check this out” is not relatable. That is content. Check this out is a sense of look at this and come see, buy, or try it out. Actionable marketing must be earned by having a solid 10k people who have bought into your brand first. Here are 5 tips to help spread the Experience of your Brand. 1) If you are doing it for attention, stop : It sounds like an oxymoron but doing it for yourself pushes any potential new audience members away. A Brand is based on a message styled through a particular voice and image. Spread a Brand’s message in a natural way to allow us a chance to relate and connect on an emotional level. 2) What did you do and/or learn today? : This is experience. Experience is filled with the process of learning and doing. It is less about what you are doing and more about how you feel about getting ready to do and or how you feel directly after doing it. Your emotional connection to the life you live will lead to others connecting. 3) James Franco Instagram (Poetry vs selfies) : Having a PhD and a MFA for English / Poetry, and being a published poet, it would almost make sense to push poetry. Well on Instagram his selfies of him involved, or experiencing his life, gets more interaction than his poetry posts. His poetry is a “Check this out”. You can mix the two, but using a ratio. 4) Selfies are not experience : You want to show more than your face in a selfie. There must be a message between why you are taking the photo and where you are doing the photo. Tell a story with your image that helps propel your Brand’s overall message. More importantly, what is written along with the image is as important to move your Brand. 5) Vague and informative : “Tonight was an amazing time performing in Brooklyn”. It says a lot without telling the whole picture. The concept of vague presentation is keeping it up for debate and developing conversation with your audience. You want it to intriguing them to say “You performed tonight! ?, Where?” and thus a conversation! There is always something to say. In fact there will be moments that our considered time sensitive. Thoughts which only pertain to what is going on right now. In life a Brand might want to express a connection about real time events going on. How does this Brand keep pushing its Experience in the first year or two, when there are subject matters it wants to be a part of? This comes down to ratio. Rule of thumb is for every four moments of Experience pushed, one push of content is allowed. In the infant stages of a Brand the experience is much more important. Pushing how that Brand is growing has more power over an audience than what ideas, material, bi-products, or ‘things’ are being sold. How that Brand is getting to the top, what they are doing, how they feel about it, when and where you were (more than where you are going to be), these pushes are the Experience. They represent the travel, the journey of the Brand growing a relationship. 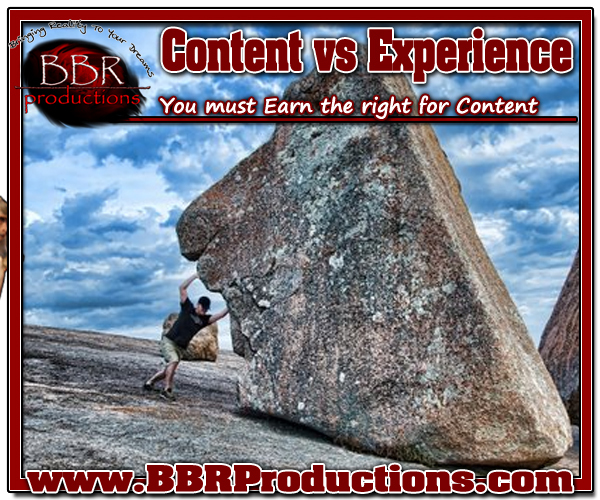 Content can become the defining purpose of a Brand if it is pushed too hard over the experience. In the beginning when trying to connect to an audience. An audience can become familiar and attached to the material being pushed at them, that they are not truly connecting to the Brand in a relationship. People are in relationships because they enjoyed the original points of interest. When a relationship’s dynamic changes slightly, or drastically, it can cause a rift in that connection. To get the most out of Marketing it should come naturally. Yes, posting a huge AD up of “Come See Me Now!” along with whistles and horns blowing could get people’s attention, but this is wanting attention. What if the process was about getting people aware of a Brand to create interest which ultimately generates sales? Throwing Content up, thoughts, or ideas, is a way of saying look at me, for a moment. Where as pushing experience directs people to become a part of a Brand for life. Content can become overwhelming at times. Or worse, it can pigeonholed a Brand to a certain style. Getting attention happens when people become aware then interested. This occurs with experience. 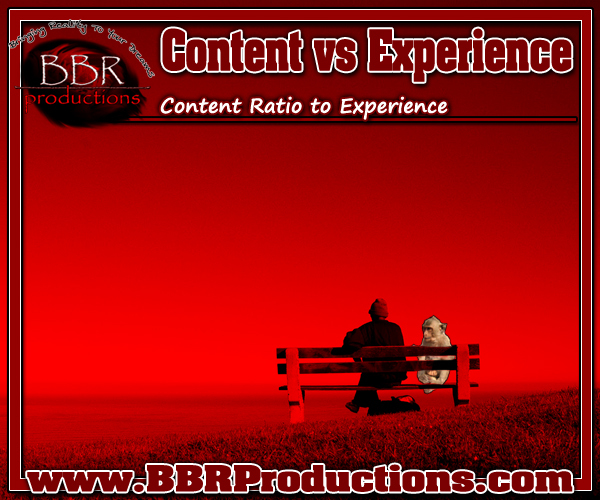 If content is necessary for the soul, and ideas / thoughts need to get out, then keep the ratio to a 4 to 1 in favor of a Brand’s experience. This way people are slowly seeing what is selling, but at the same time given the choice to follow a Brand’s adventure. Ultimately, in the beginning of a Brand’s life, getting an audience involved is more important than expressing content. Building an audience is primary, and letting them follow the growth of said Brand is important for longevity. Content is the equivalent of asking people to come buy, see, watch, and touch a Brand. It pushes them away. They want to choose to become engaged. While being told to do something is off putting when a Brand has not earned the right for content. Look at AD’s from major companies. They never say Buy me! Before an audience is already buying into a Brand it is important to allow them to grasp onto an emotional connection. A feeling of attachment to a specific Brand’s voice, image, which creates a conversation. The “I am going through the same thing at the level I am at now” feeling. Audiences love to feel a part of the adventure. That is the emotional connection. They will become very passionate about what kind of content is pushed on it. Best example is the passion audiences have with Comic Books turned into Comic Movies: who is cast, when they look like. All these things come down to Brand Value. That Brand Value is the what those characters represent. What their voice (Message), image (look / feel and style) or present to their fan-base. In turn, this creates a conversation. Wolverine never having his traditional yellow, or even brown, uniform flips people out. The outfit is a part of his Brand. This is all content. But the experience of that Brand is what is earned, and audiences follow the experience and their connection to that experience. This is why Hugh Jackman can play Wolverine and a large majority of fans like him as the Berserker! People really love what Hugh Jackman’s personal Brand is. He took his relationship with his fan-base and his personal Brand, to bring strength and awareness to his many humanitarian causes. His fight to change the course of Global Poverty with his ‘Laughing Man’ Coffee. Or that he is known as one of the most humbly kind people in show business. Point is, people follow Hugh Jackman because they latched onto his Experience. The ride of his life, kindness and his love for this business of entertaining and educating millions. He earns the right to say “come see Wolverine 3”.